For two decades people from eight villages in Kalpavalli region in Andhra Pradesh's Anantapur district laboured hard to turn a vast expanse of wasteland into a forest. But the effort seems to have gone waste as the green cover is being ruthlessly destroyed to set up wind farms. Enercon Wind Farms (Madhya Pradesh) Pvt Ltd, a group company of Enercon (India) Ltd, a subsidiary of the German company Enercon GmbH, is setting up a 20 MW wind energy project in the area. Over 20 years ago, Kalpavalli region used to resemble a desert. Hilly terrains, dried streams and tanks and hard surface bereft of top soil marked the landscape. Then came the turnaround. A voluntary organisation and village residents brought to life a thriving wilderness on 2,833 hectares (ha) of land in Kalpavalli, marked as revenue wasteland. At present Kalpavalli has 264 floral species and 105 fauna species. Wild boars, black bucks, foxes and porcupines can be found in the forests. Kalpavalli also provides livelihood to about 400 families (see 'People earn a living from forests'). Kalpavalli falls within Chennekkothappalli, Roddam and Ramgiri mandals of Anantapur, the second-most drought-affected district in the country (Jaisalmer in Rajasthan tops the list of such districts). The eco-restoration programme of this wasteland was started in 1992 as a common property development programme of Timbaktu Collective, a voluntary organisation based in the remote Chennekkothappalli (C K Palli) village, about 20 km from Kalpavalli. 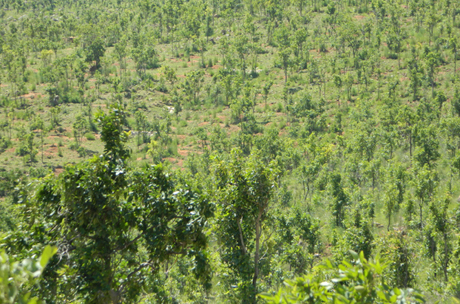 The villagers jointly protected the regenerated forests, and in 2008 they registered the Kalapavalli Mutually Aided Tree Growers’ Society with a membership of 1,969. The efforts were headed by Bablu Ganguly and Mary Vattamattam, a couple working on developing alternative models of sustainable development since 1990 (see 'Agro-forest nurtured for 20 years). The face of Kalpavalli has completely changed in the past one year after Enercon's entry. The company has permission to install 48 windmills, and the state government has allotted 28 hectares (ha) of land at a cost Rs 25,000 an acre (0.4 ha). Apart from the allotted land, the company has used 79.3 ha of land for road construction. The company got permission from the district administration to set up the windmills after the Non-conventional Energy Development Corporation of Andhra Pradesh (NEDCAP) sanctioned the project in 2004. According to the company wind monitoring studies have been undertaken by the NEDCAP, and Ministry of Non-conventional Energy sources notified the location "as a proven windy site to encourage investment in the private sector". The result has been devastating. Almost all the hillocks in Kalpavalli are bearing the brunt of wind energy production. Vegetation cover has been removed and hilltops are being cut for windmill installation. 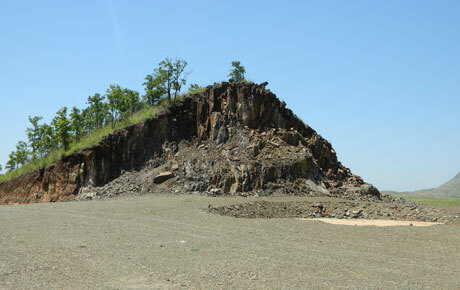 Deep cuts of about 3 to 4 metre have been made on the slopes to develop roads, but without any retaining walls which may lead to massive soil erosion. The company has so far developed 40 km of road, ranging 10m to 50m in width. 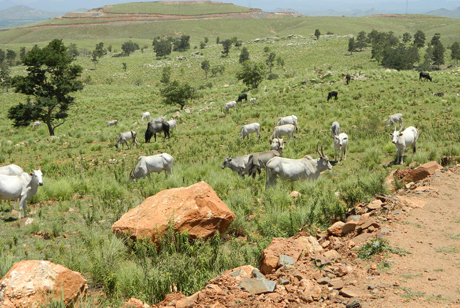 The deep cuts have heavily damaged pasture routes, making it impossible for cattle to climb up the hills. “We have not given permission to the company for construction of roads,” says Anitha Ramachandran, joint collector of Anantapur district who is in-charge of land allotment in the district. Despite being asked to submit a request for permission, the company has not done it so far, she says. Enercon started its installation works after entering an agreement with the Kalpavalli Mutually Aided Tree Growers Society. The company had agreed to pay Rs 20 lakh and has paid only Rs 12 lakh so far as compensation to the society. As per rule, when forestland is diverted for other purposes, Rs 15 lakh should be paid for every 0.4 ha, points out the state biodiversity board chairperson, R Hampaiah. “It’s true that this was revenue wasteland. But it has been regenerated and has a forest which is common property,” he says. The company has bought 1.6 ha for the village community for building a school. “Apart from this, the company has paid off villagers and local politicians, causing a deep divide and mutual distrust in the community,” alleges Gopal. There was strong resistance among people initially, but now everybody keeps quiet because of the money involved, he says. A few thousand rupees is a huge amount for the marginalised farmers who are in acute distress. Enercon declined to comment on the adverse impact of its project. While the company is moving ahead with its project, the society maintains that it has been grossly misinformed before signing the agreement. “They (Enercon) said they would use only the existing paths and would take only a little space for installing the windmills,” says Roddam Pothenna, director of Kalpavalli Society and a watchman of the windmill company. “If we had known this much damage would happen, we would not have signed the agreement.” The company pays him Rs 3,000 as salary. Many villagers like B Ramachandra of Shapuram village, who is a member of the society and also working as a watchman of the company, says it’s really painful to watch the forest which people painstakingly regenerated and protected getting destroyed. “The company has cut a large-number of trees,” he says. Mushtikovila tank has already got silted, say villagers. They are scared to resist.“Windmill people threaten us and tell us if we go near the work site, they would call the police,” says B Nagamani of Shapuram. Apart from damaging the grasslands, catchment area of streams and vegetation, the windmills may cause water conflicts in the region. For base construction of one windmill, one tanker (5,000 litres) of water is needed, and for base curing about one tanker everyday for 25 days. Enercon is taking water from the village wells by paying just Rs 80 a tanker. While Enercon is setting up windmills within Kalpavalli, two other companies, Samiran Jaipur Wind Farms, an associated company of Suzlon Energy Limited, and Helios Infratech have started their on project outside Kalpavalli. Together, they will set up 168 windmills. As the biodiversity board chairperson Hampiah points out, if the villagers are genuinely concerned about their common land getting degraded once again, they can form biodiversity management committees and give submission to the board against the destruction in Kalpavalli. Or they can move court. The large-scale destruction has dismayed Mary and Bablu who started the eco-regeneration programme. They are critical of the district administration's role which has been implementing water and soil conservation efforts in the water-starved district under NREGA and at the same time allowing the model project to be destroyed in the name of non-conventional energy. “There’s absolutely no perspective or coordination between different wings of the government. The terms and conditions of the land allotment says the government will take back the land if it feels land is needed for any other important purpose or for mining activities,” says Ganguly. The wasteland regenetation project in Kalpavalli began with an experiment on a 13 ha plot of barren land that Mary and Bablu bought along with their friend John D’Souza in C K Palli. They named the place Timbaktu. “For us, it has never been an experiment. It was our life and breath,” recalls Bablu. The idea was to create an agro-forest habitat in a desert-like region. Over the decades, Anantapur has been experiencing desertification due to soil erosion, sand-casting, mono-cropping, use of synthetic chemicals, deforestation and excess use of ground water. “We wanted to find solutions to the degradation of environment and lives of people living around,” says Mary. So the couple settled down in C K Palli to understand the geology and topography of the area. In the process they came to know that Anantapur had a rich tradition of rain water harvesting—tanks and kuntas—and irrigation systems. It had a rich biodiversity and forest cover. The system was lost due to lack of ownership, destruction of the forests, wrong agricultural practices and a growing dependence on the government as the provider of all facilities. The Timbaktu team directed their efforts towards collecting locally available seeds, harvesting water, conserving soil and planting indigenous varieties of trees. Then they protected the land from cattle. The outcome was beyond their imagination. Within two years the soil sprang to life. Then slowly a forest emerged with 400 varieties of trees, shrubs and creepers. “Villages in Anantapur have thousands of acres (one acre equals 0.4 ha) of revenue wasteland. We decided to extend the Timbaktu experiment to this land,” says Mary. The initiative was started on 50 ha of wasteland in Mushtikovila village in C K Palli mandal. The concept was to promote eco-restoration through natural regeneration. “It took over a year to convince the villagers the need for water harvesting and soil conservation in revenue wasteland in their village,” recalls Gopal K, a resident of Mustikovila and a Timbaktu team member. The villagers were mobilised. A Vana Samrakshana Samithy (forest protection committee) was formed, fire-break lines were made, seeds were collected and stored, rock-fill dams, farm ponds and mud bunds were made to recharge groundwater and to prevent soil erosion. The shepherds were made a part of the process and grazing was controlled. The local bodha grass seeds were propagated and the hay from this used as fodder. Over the next seven years, seven more villages joined in and over 2,800 ha of contiguous revenue wasteland was protected and regenerated into a forest. In 15 years, hills turned green, valleys became dense and about 250 water bodies and streams have regained life. The Kogira stream became perennial. Mushtikovila tank, which is spread over 162 ha and was the main source of irrigation in the area, once again had water. “We even started cultivating 162 ha of paddy fields,” says Boddemgari Siddappa, former sarpanch of the village. “ The focus was on joint community ownership of forest and forest produce,” says Bablu. During 2008-2011, Rs 3.5 crore has been spent in Kalpavalli under National Rural Employment Guarantee Scheme (NREGS) and Rs 4.12 crore under Food for Work programme. This explains why when the planning commission says that 37% of the rural population live under the poverty line, which is defined as the STARVATION line, are still alive today! They still have some places which gives them sustenance. But then as P Sainath points out more and more people are getting destitute, as the forests are being taken away from them, like it is in the above example, or they have moved over to a cash economy, and up to their neck in debt. I have seen similar scenes in Orissa, where the government has cut up roads using big machines, where most people don't have enough work. The JCBs have just uprooted trees and earth and dumped them down the side, destroying forests covering more than five time the road that is being built. Surely, more labour intensive technologies, which would have saved many of the trees, and built bunds, with tree uprooted where the road is to come up, would be a smarter way of doing it. The width of the roads were obscenely wide. and the rain was already eroding the road, and the field were getting flooded with red mud, destroying natural rice steps. And guess what, all this destruction was being done by the government, who wanted to sell the mining rights at a higher price! I suspect that the long terms plan is not so much to set up windmills, but to grab land, for mining at a later stage, for the Kalpavali range is in line with Bellary.. I am all for green energy and development. I am however shocked by the callous nature of our planners and business. The work done over 20 years in Kalpavalli is threatened and partially destroyed, by some people looking at maps and pieces of paper, while planning. The same work could have been done with greater sensitivity, if there was a genuine care for preserving our eco system. This cant be undone i guess, however there has to be serious debate and thought put in future programs, where green development does truly incorporate sustainable development of local areas, keeping in mind the long term effects of cutting hills and 'wasteland'. In this case, the whole Kalpavalli region is a catchment area for the chain of tanks starting at Mustikovila. Its difficult to prove, but the work done by the Kalpavalli Vansamraksha committees has improved the groundwater and the water collection in the reservoir/s. It can only be heard from the locals. I hope this article will help a precious effort, be recongnised and future policy planning forced to take into account the collateral damage inflicted by callous planning. These so called green businesses are not really 'green' meaning. Again I am really shocked about the lack of scrupels and also sad about what it meens for Timbaktu! What can we do to help them?! This is not only because of green energy but because of financial interests and for serving the energy demand of people with more money. What about the nature and the humans living there? This is not for them. It is ludicrous that an eco-restoration initiative that has widespread support and active involvement from the local community should get destroyed overnight to serve corporate interests in the garb of so called "green development". 3. Agro-forest nurtured for 20 years saying Mr. Bablu as Ã”Ã‡Â£For us, it has never been an experiment. It was our life and breath,Ã”Ã‡Ã˜. It is crazy. I wonder what kind of studies must have been undertaken by NEDCAP. What green development are they talking about. It is only another source of earning for those govt. officials. There is no point killing the hard-earned greenary to get some unreasonable windmills. There are many companies who have captured much of our land just for their money making tactics. It is the clear cut violation of the rights of the local people and poor coordination among the local departments. Certainly, the proposed development is not people oriented instead looks towards business. It is the fact that should have B2b & B2P approaches as the local people should get the benefit of the development took place in their area. What happened to the rehabilitation packages? Money compensation alone will not give matched results. Instead, land based rehabilitation should be essential component as there is no substitute for the livelihoods which they loos in most of the developmental activities. In case, if there is no other option, then the required land should be used by balancing its negative impact to the people and surrounding environment. The PAPs should be involved at all levels starting from the stage of conceptualization to planning to implementation including monitoring and evaluation. This strategy will lead for better harmony among the people and developers. Looking forward to see that the concerned people / stakeholders will raise to the occasion to avoid such loses to the people and damage to the environment. While it is beyond one's grasp how a "Green Energy Project" can come up by destroying greenery, it is only obvious that the motives are different and suspect. Anantapur is a district no different from any desert except that you find gravel in Anantapur instead of sand. The green patches like Kalpavalli are the rare oasis one cannot afford to loose. For god's sake, don't destroy the vegetation that has been developed so painfully over so many years by Timbaktu. The concerned authorities must realize everyone will have to pay for it, or way or the other. Successful land regeneration projects like Timbaktu Collective ought to be treated as national treasures. Desertification, with its degrading of soil quality and water sources, is a huge problem globally. Everyone should be looking at successful solutions very carefully, and adopting such practices. There should be full cooperation with and from the government at all levels, national, state, district and local. Now that we have seen what can happen when there is lack of coordination and clarity between agencies, companies and local communities, it is important to improve our means to hold them responsible. A few years ago, my wife and I visited the Timbaktu Collective and their ecological-sound restoration project on 3,000 hectares of revenue wasteland which reinstated biodiversity and important ecosystem services for a number of local villages. I would humbly ask for you or a trusted colleague to review the current situation in the Kalpavalli region with respect to the wind farms of Enercon. I certainly recognize the need for clean and sustainable energy however there are methods and techniques by which these turbines can be installed and maintained that is sensitive to the ecological character of the region, especially one that was lovingly restored by community volunteers. As the hosts of the next Convention on Biological Diversity meeting in Hyderabad in 2012, it would be a shame not to be able this highlight this showcase project for all the world to see. Surely there must be ways to tap wind energy on a smaller more intensive scale, while protecting the forests? Do we need to have such high windmills. I have seen each of these blade being lugged around in multi-axle trucks. Has down to earth done any study on optimising the size of windmills in relation to the power outputs? Also optimising the size such that areas of less force of winds can also have the benefit of wind energy? Surely there would be ways in which smaller wind mills could be owned by small farmers, who then contribute their power to the grid. ( after all, I am sure that finally enercon must be taking a loan from the same banks where we put our money?) I understand the technology for such decentralised power harvesting exists, today. I am shocked to learn about this news. Non-conventional energy is definitely a requirement for India. But to bring it in without consultation, with the local community, stakeholders like Timbuktu Collective who have transformed wasteland through dedication and perseverance makes a mockery of things. People should be given a chance to assess what it means for them, to assess trade-offs. Who gains in the long run? May be even worth even raising this in German media - would such initiatives get away in within paradigms and structures in the developed world? I have been to Kalpavalli region, and seen the work of Timbuktu Collective and for that reason feel particularly devastated to read this article. I mrs thatte has found out that by static charge substances above trees plants there is tremendous tree plant growyh huge flowering fruits crop. by excess static charge there will climate change.rain is shifting from cold regions to hot regions.there will be storms like sand regions. for details contact me urgent. It is distressing to see two decades of laborious efforts being destroyed so mindlessly. It also highlights that so called "green energy" - wind, solar or others - is green only till it is implemented in a micro scale, and with the full participation of the community, and even there the impacts need to be assessed. Once green energy started becoming big, it will necessarily have big impacts. Where "green" energy is implemented on large scale, in a centralised manner and by big corporates and global giants, mainly for enhancing their own profits, it acquires many of the undesirable characteristics of conventional power like large hydro, coal etc. We hope that this development in Kalvapalli is stopped at once, and re-examined with the local community. I have been discussing this issue of windfarms being built in this area (and other similar ones such as the Roumanian Banat region case)with our students as a prime example of misguided "development". Many such projects the world over ignore natural capital and non-monetised benefits which areas such as this one bring to local people. After the projects are implemented, not only the locals are left poorer because their resource base is degraded, but all of society is left poorer because it loses its natural capital (water, land, biodiversity). The GDP does not measure these aspects, and thus economic growth can lead to poverty rather than wealth. I believe that true development in this case is the voluntary work that the local people and Timbactu Collective have performed over the last twenty years to regenerate the natural capital of the region. The government should recognise their contribution and do all it can to safeguard the ecosystem which helps so many families survive. really its a sad news and as a green / solar LED lighting activist i deeply hurts to read this. KILLING 20 YEARS OF GREEN TREES - Where we are going, TREES are the lives of not just many but must for everything. LETS NOT ALLOW THESE TYPE OF ACTIVITIES BY ANY ONE AGAIN. CUTTING MAY TAKE FEW HOURS BUT REARING CAN TAKE YEARS TO YEARS. 40 km of roads through reforested area. It's not a day's work. At least one year might have been taken for building roads. Why Timbaktu team did not move the court? Just one public interest litigation would have been enough to save Kalpavalli. And it's quite clear from the report that the community is divided. They are bribed. I don't understand how can somebody be Kalpavalli Society's director and at the same time watchman of the windmill? What's the use of lamenting without doing what should have done? In this case, I feel, villagers are not real victims. From the report it's very clear that the community which took efforts to green the barren region itself has given approval to destroy the forest. 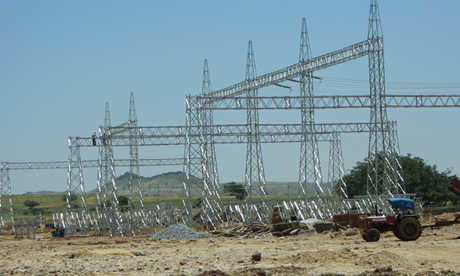 Why POSCO is still unable to start its project in Orissa? Just because the strong resistance from people who are ready to die for their land. Here that has not happened. What have been the media doing all these months? Why to blame the company and the district administration alone? This is shocking. A few years ago when I on be half of my organisation, Kalpavriksh was compiling a Directory of Community COnserved Areas in India. I came across Kalpavalli as one of the good examples of communities regenerating a completely degraded "wasteland". This was documented in the Directory see www.kalpavriksh.org for details. This news item came as a shock. In the name of green energy windmills are coming up in different parts of the country,particularly in ecologically sensitive areas. NO Environment Impact Assessment is needed for windenergy. If there is any movement by the commnity to oppose this initiative we would like to support it. I would also like to inform them that we are opposing a similar project by enercon on the boundary of Bhimashankar wildlife sanctuary in Maharashtra. For every painful step forward , made with the hard labour, hope and trust of individuals, our government takes a leap backward with thoughtless and insensitive action. The supposedly "eco friendliness" of windfarms is a blast of hot air, and is being promoted by those who stand to gain vast amounts of money. As usual our land and its people are ripped off to serve the greed of a few. As usual the painful steps forward by local people, made with hard labour, hope and trust, are denied any validity by government taking a huge leap backwards, through its thoughtless and insensitive actions. Everyone knows that "ecofriendly" wind farms are made in these areas to ripoff the poor and to benefit corporations who are not interested in developing our nation but have only a beady eye at their bottom line. Shame on them.Let us do what we can to stop this. It's so sad to see this hurt forest. Stop it! Windmills have been set up deep within the western ghat forests too. Windmills have not always been profitable even in high-wind areas. In a few places they have been abandoned or kept idle most of the time. In Tamil Nadu, almost all the sites are owned by the people who own the windmills, so the profits come not only from subsidies, but also through increase in real estate prices. Going against the existing technological trends is not always easy. Hopefully the loss here will be compensated by similar initiatives here. This is an informative article but it needs to be more balanced and informative. 1) The trees can be replanted after the windmills are set up. There can be a provision in the agreement for replanting of trees with the species name included. 2) The water use for 25 days is not a big deal and if the water is so scarce, then it can't be bought for Rs 80 for a tanker. There seems a mismatch. 3) The roads needed for transporting a windmill are the roads that can/will be used by villagers also for transport of forest produce. If the path of cattle has been obstructed then some ways can be made to allow the cattle to cross roads. Again, this can be built into the agreement. 4) The 50m area that you mention for the road, is for the layout of the components during construction, again most of it can be replanted. 5) You can request the wind turbine companies to openly publish their guidelines for construction of wind farms with minimum impact on the local environment. These can be published by the MNRE/C-WET or CSE also.